We sell professional design solutions, based on affordable 3D computer-aided-design (CAD) software – SOLIDWORKS – to product designers and engineers across all areas of industry. We have more than 13,000 customers ranging from one-man bands to large global companies such as Clarks Shoes, Brompton Cycles and the Royal Shakespeare Company, who use our services for set design. 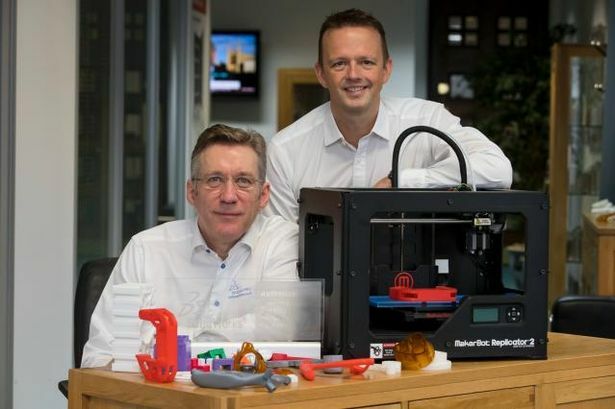 I founded the company 20 years ago with my business partner, Simon Turner, and we are now recognised as one of the largest SOLIDWORKS resellers in the world. This means we’re able to influence how the software develops, both commercially and technically. We sell our systems to businesses that manufacture or design products. We also train them on the software and certify their level of expertise – so we have a partnership-based relationship with our customers. We are focused on the UK and Ireland, and more than 50 per cent of our systems are sold to new customers. We now employ 230 people, including around 60 at our Leamington Spa head office, and we have multiple sites across the country in locations such as Cambridge, Manchester and Durham. Prior to BGF’s investment, all the shares were owned by the two co-founders, so it felt like a big step to relinquish equity. We had looked at other funding options in the past but BGF’s was the only one we took really seriously. The key thing for us was their light touch approach, commitment to never taking more than a minority stake, and their ability to invest long-term. All of this resonated with us because we wanted to protect the culture of our business. Since the BGF investment, we have doubled our headcount, turnover and profit and, shortly after they came on board, acquired Cadtek. Cadtek has a similar culture to us and operates from Manchester and High Wycombe, so the acquisition plugged two geographical gaps. In August 2017 we bought NT CADCAM which has offices near to Oxford and in Knutsford. We are bringing these companies together to create an integrated and efficient business. This process is very much ongoing and has been a major focus of effort over the past few months. There may be opportunities for further acquisitions in addition to continuing to deliver organic growth, and we’ve signed leases on new offices as we continue to expand in the UK. Finding good engineers with the right attitude has been key to taking us forward. We’ll continue to look for good people to join us. I have always invested lots of my time in searching and interviewing – it’s where we get our biggest returns. We first met Alan and Simon in mid-2014. We got to know the business and the team and vice versa and invested £8 million in March 2016. The investment happened just prior to the acquisition of Cadtek, which was a big step as all the growth historically had been organic. Having a long-term investment partner on board helped Alan and the team to fund the acquisition, but sharing the risk and having BGF’s backing also made them feel more comfortable about going down the acquisition route. We spend time getting to know companies that are on interesting trajectories, which is how we identified Solid Solutions. But we also had a connection through the company’s lawyer and an old colleague of mine. Solid Solutions had a strong financial track record – sustained revenue growth, good margins and cash generative. When we’re looking at backing a company, the culture of the business, the strength of the management team and how ambitious they are for further growth are all very important to us. The two things that particularly stood out about Solid Solutions were the efficiency and culture. From the efficiency perspective, the company had created its own scheduling system which identified how to have the right staff in the right place and at the right time to fulfil customers’ expectations. It was very sophisticated and better than anything I’d come across in similar types of businesses before. This innovation and the attention to detail around its execution gave us a good viewpoint into Alan and Simon’s approach to running the business. We identified an opportunity because the team had done such a great job of building an efficient, high-growth and cash-generative business. We could see the potential for the business to embark on an acquisition strategy because they’d already applied such a strong mindset and operating model to their own business. We knew this could be replicable. From the cultural side, CAD design is a growing industry that relies on talented software and mechanical engineers. There is high demand for people with these specialisms but Solid Solutions demonstrated a really excellent level of staff retention. Alan has a huge focus on keeping people motivated, excited and interested. This can be seen in the high-quality of the work environment, as well as the high-quality of work for customers. Looking ahead, plans are to continue with the same strategy as the past two years, which has served the business well. Solid Solutions has gone from a turnover of £20 million at the time we invested to around £40 million now, which has been generated through organic growth and the two acquisitions. There may be new opportunities to acquire other companies and there is still potential for more organic growth – so the aim is to become an even bigger player in the UK market. BGF is the most active and influential investor in growing companies across the UK. The independent company provides long-term capital for a minority stake, from earlier stage investments to established private and AIM-listed companies.